The best way to save money on landscaping is to get rid of your lawn (assuming that doing so does not violate your homeowner association rules). Without a lawn to keep up, you save money on fertilizer, water, chemicals, and lawn mowers. This article describes the fastest, cheapest, and easiest way to replace your lawn with a low-maintenance garden of rocks, ground cover, native plants, and mulch. Sketch a design for your new garden. Don't be overly precise - just decide roughly where to put the plants, the rocks, walking paths, drainage swale, and edging (if necessary). Based on your design, you can then estimate the amount of materials (weed barrier fabric, edging, rocks) that you need. The next thing to do is kill the grass (and the weeds). Dead grass is easier to remove. If you try to remove the grass without killing it at the root level, it will grow back. 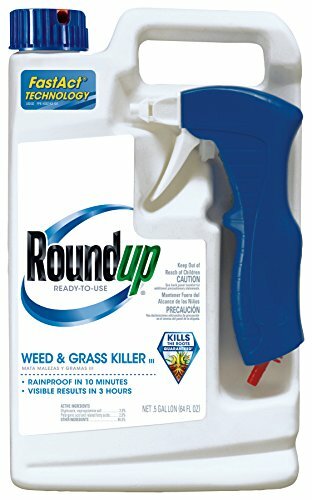 The fastest way to kill the grass is with Roundup, which I was initially hesitant to use. I practice organic gardening and don't like to use chemicals if I can avoid it. But in this case, using Roundup is sensible. To avoid any chance of the chemicals causing harm to other plants or being washed into local waterways, apply the Roundup when winds are light and dry weather is forecast for several days. Wear gloves and avoid getting the chemicals on your feet and tracking it to other areas. Follow the directions on the Roundup label. You might need to make several passes. Then wait a couple of days for the grass to die. After the grass is dead, pull it up, roots and all. This step is the most difficult. If you are not in good physical shape, consider hiring help. Otherwise, put on gloves, get a trash bag, and start pulling. Get all the roots. You don't want the grass to grow back. You might need to install edging to enclose your garden or to define the border of your neighbors property. The edging keeps grass or weeds from encroaching. You can also use the edging to contain areas of your garden, such as the swale (drainage ditch). Your local garden center should have many types of edging. I used a brown-colored flexible edging that looks natural and is easy to cut and bend. After you remove the dead grass, you are ready to install the weed barrier fabric, like the professional DeWitt brand. It works really well and resists weathering. Use a pocket knife to cut the fabric into pieces that fit your area. If you plan to plant ground cover or native plants, leave some open areas or cut holes in the fabric where you will plant. Plant a mixture of low-growing ground cover and native plants. Native plants grow naturally in your area and need minimal fertilizer, watering, or maintenance. Ask at your local garden center for the best ground cover and native plants for your area. Consider the amount of sun available. If your yard gets full sun, pick a ground cover that does best in that environment. Find out how big the plants will get and then plant them far enough apart to allow for growth. Rocks and stones add interest to your garden. Make sure that the ground cover and plants, at maturity, will not cover the stones completely. If possible, use stones with a variety of colors. Where I live, rocks are expensive. Luckily, I got mine free from a neighbor. Consider asking around in your neighborhood. If you have drainage issues, consider creating a swale. Locate the area of your lawn where water pools, and dig a shallow ditch toward the street to aid drainage. Put edging along the sides of the ditch, line the bottom with weed barrier fabric, and then fill it with river stones. Make sure the stones are heavy and do not float. The last step is adding mulch to cover the weed barrier fabric and to help conserve moisture around the ground cover and native plants. Over time, you will need to replenish the mulch as it breaks down. But as the ground cover spreads, you will need less mulch to cover the bare areas. With no lawn to care for, maintaining the yard is much easier. You still need to weed occasionally because the mulch eventually breaks down and mixes with dirt to create opportunities for weeds. But, if you stay on top of it, this effort is minimal. This material resists weathering well and is a natural brown color. Get the Roundup with a built-in spray nozzle. It is easier to apply. Great ideas to try. We no longer have any lawn. We have pea gravel instead of the lawn. This saves wasted water, less expenses on buying and mowing the lawns. So think it is a win win situation. Sovocool and Rosales Xeriscape Conversion Study. Las Vegas, Bureau of Reclamation U.S. Department of Interior: Southern Nevada Water Authority, 2005.